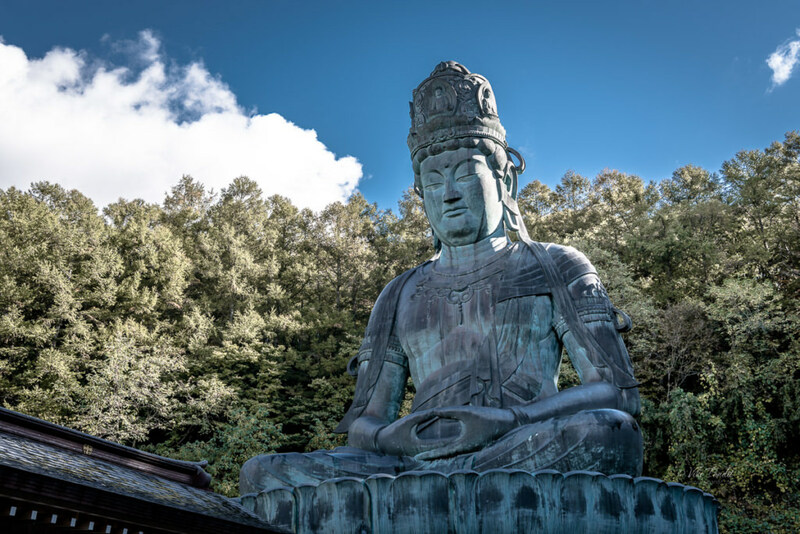 Today we head to the suburbs of Aomori to explore a very recently built temple grounds that boasts of Showa Daibutsu, the largest seated Buddha in all of Japan. After a lot of ifs and buts, we eventually decided to visit the Seiryu-ji Temple. 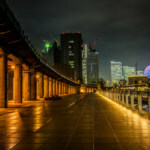 The weather around Aomori had been overcast with regular spells of rains. Seiryu-ji Temple (青龍寺) is located in suburb of Aomori city. It has on its premises some beautiful buildings including a five-story pagoda built exclusively using Aomori Hiba wood. 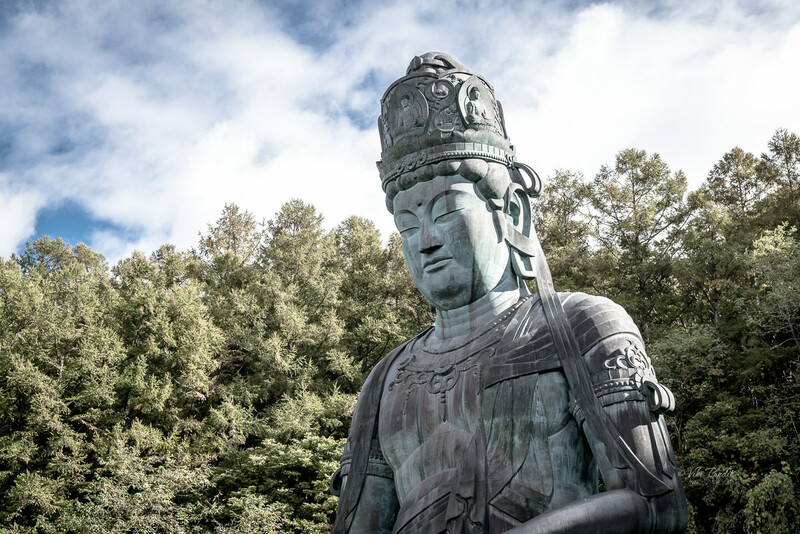 Along with the temple grounds we were particularly interested in exploring the huge Showa Daibutsu, with height of 21.35 meters, which is Japan’s largest seated bronze statue of Buddha, even larger than one of Nara or Kamakura. We took the earliest available local bus from the Bus terminal which is right next to the train station at Aomori. It takes about 50 minutes for the ride. Just before you reach the temple, the bus passes through a beautiful town where the roadside are lines with ginkgo trees which had turned vivid yellow during the fall. Undoubtedly one of the most distinct and beautiful of all deciduous trees – the ginkgo stands out with its unique, fan-shaped leaves turn a stunning yellow color in the fall. We reached the temple by 8.20 am. 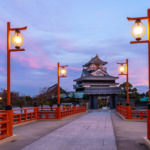 You can also take the municipal bus bound for Kuwahara, and if you get off at the last stop of this bus line you can walk to the statue in about 10 minutes. Among all the Japanese temples I have visited, the Seiryu-ji (青龍寺) is the youngest. It was founded as recent as 1982 by Acharya Ryūkou Oda (織田隆弘), who later also helped build the Shōwa Daibutsu statue (昭和大仏) in 1984. 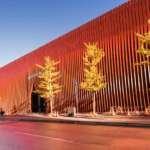 Approaching from the bus-stop, the first structure that came to my notice was the Daishi-do, a vibrant red hall named after Kobo Daishi, founder of the Shingon sect of Japanese Buddhism. This building was under maintenance so we carried on over an equally bright bridge to the Kondo hall. Just across the bridge one can find the ticket booth on the left. It costs Yen 400 per head for individual visitors. The premises were mostly deserted except for the temple staff, busy in their morning exercises. Leaving our shoes at the entrance we entered the main Kondo hall. 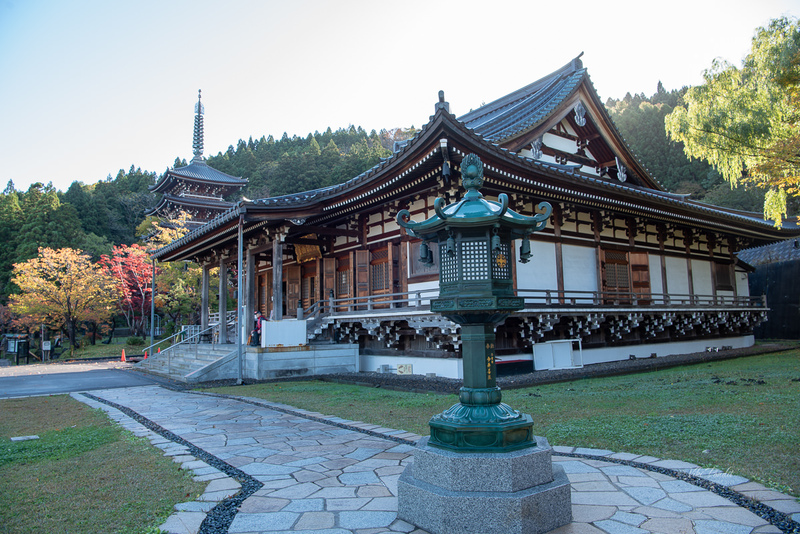 The Kondo hall and other wooden structures at the temple grounds are all built using local cypress wood known as Aomori Hiba. Hiba ( Hinokiasunaro ) is known as one of the three largest trees in Japan alongside hinoki and sugi. 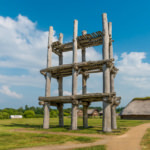 It’s considered the best building material for pagodas and shrines as it naturally resists rot and mold, which is particularly valuable in humid summers in Japan. A compound called hinokitiol that’s found only in Aomori-bred hiba trees also banishes bugs like termites from infecting the wooden structures. In temples, where cleansing and purification are important parts of religious rituals, the natural anti-microbial and germicidal properties of hiba play an important symbolic part as well. The inside of the Kondo hall was dimly lit with a heavy scent of incense creating a deep sense of peace and tranquility. 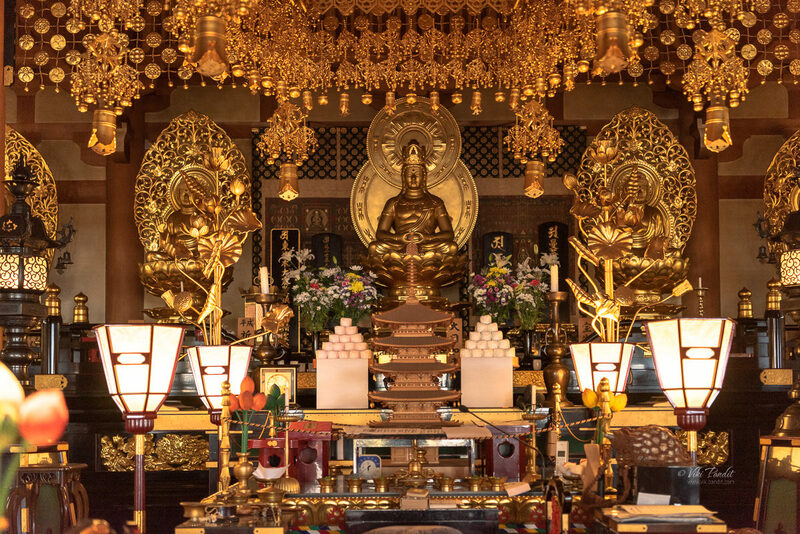 A golden Buddha sits at the end of the hall surrounded by many artifacts. One the left side of the main hall lay many souvenirs, but the shops hadn’t opened by then. 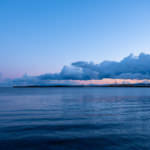 I sat there for a few minutes taking the chance to quiet my mind, banishing all external thoughts that intrude on my peace in that stillness in time. Towards the back, a narrow corridor runs around the three sides the main hall. Along this corridor, there are a number of paintings of what I assume are Buddhist priests and saints, including one large painting called ‘Descent of Amida and the Heavenly Multitude‘. This hugely popular painting shows Amida Buddha, resting on a lotus blossom and holding his hands in a symbolic gesture known as a mudra, typically surrounded by celestial attendants in a sea of swirling clouds. After paying our respects, we came out of the Kondo. 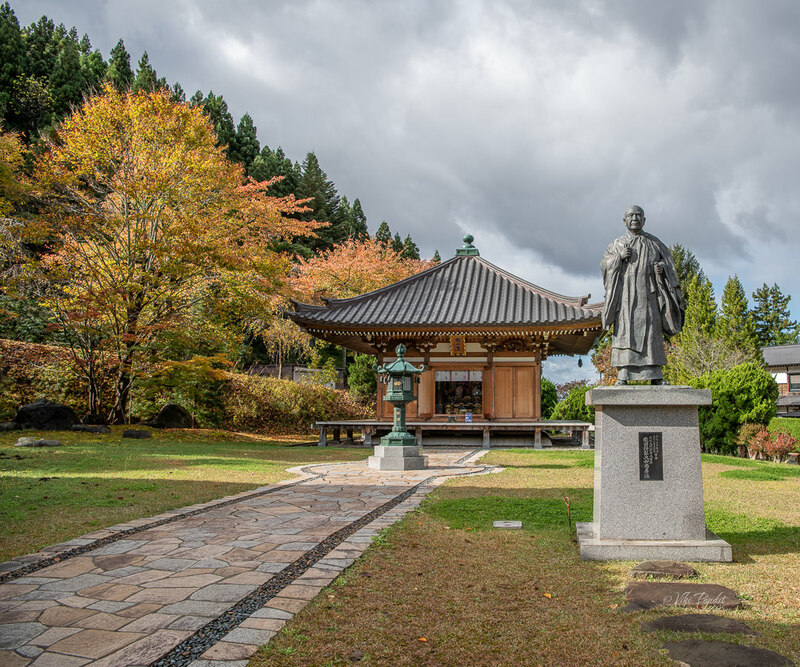 Close to the Kondo, towards our left lay the Kaizan-do, a smaller wooden hall with a statue of Kobo Daishi in his pilgrim attire in the front. On the opposite, hidden beside the Kondo hall, you can find one the most beautiful pagoda in Aomori. 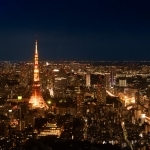 At 39 meters it is the highest wooden pagoda in all of Tohoku. 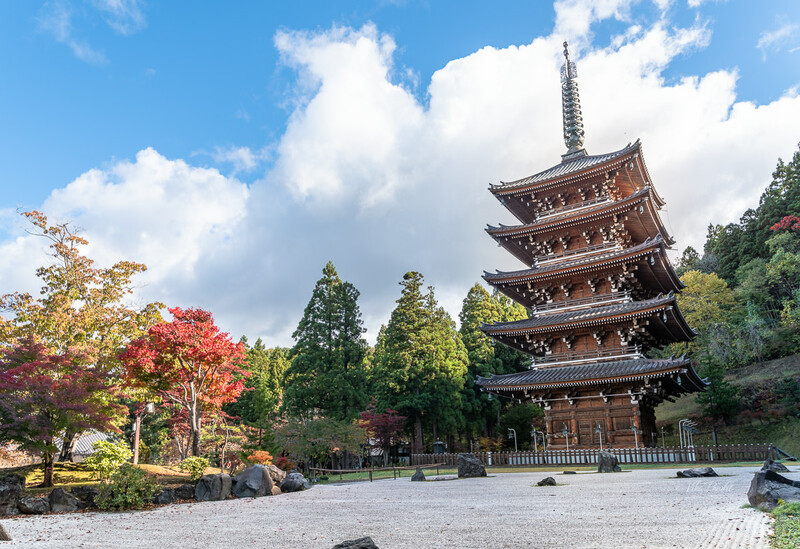 In the delicately designed rock garden, the pagoda stands impressively against the greenery and the blue sky, with a touch of red added by the momiji trees. 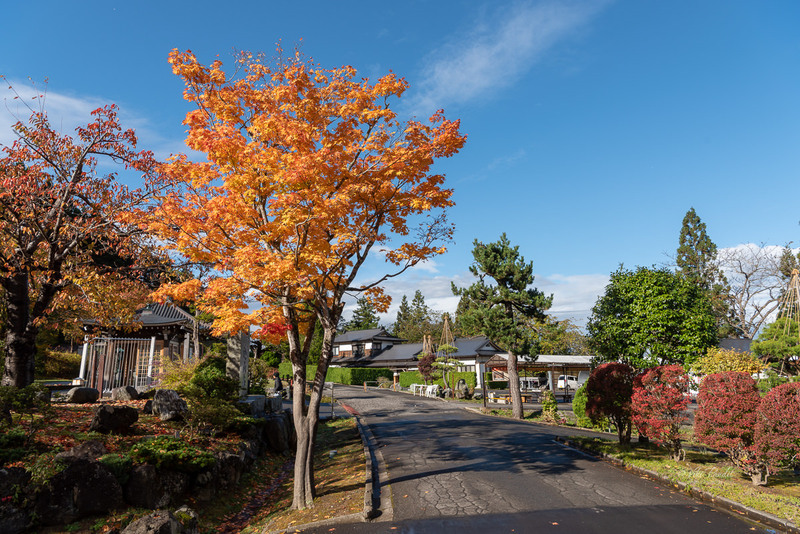 We were lucky to be there at the temple grounds when Fall was in full swing. 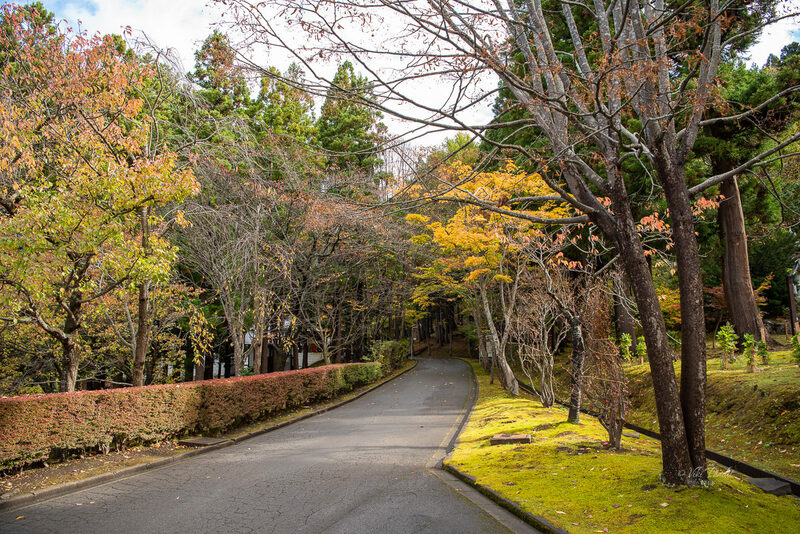 Koyo (紅葉) refers to the phenomenon of changing autumn colors before the leaves fall to the ground. 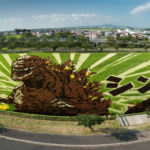 The koyo season in Japan typically begins in mid-September in Aomori, and gradually spreads to the southern prefectures of the Japan. Momiji 紅葉, or Japanese Maple Tree, is probably one of the most beautiful type of maple trees there is, especially in the fall. Its thin elegant leaves turn such vibrant colors every fall, from bright yellow to deep crimson. The species of maple generally determines the color the leaves will change: red, yellow or brown. 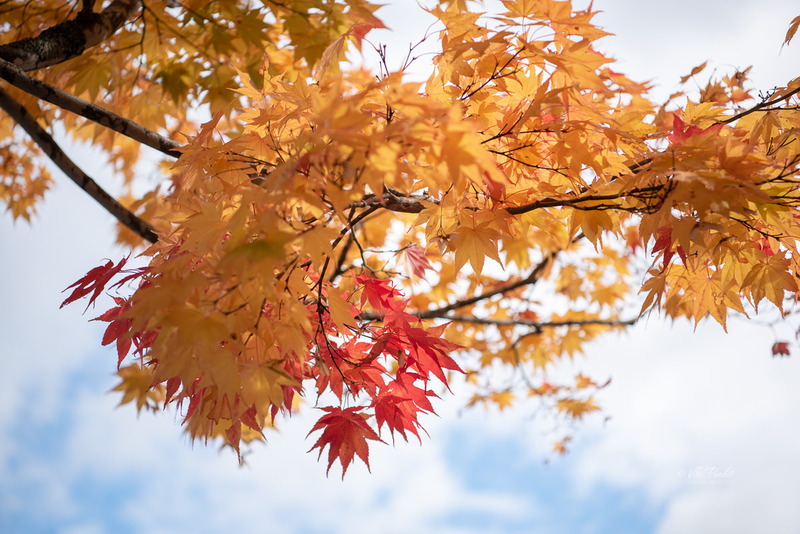 Although the word koyo literally means “red leaves, ” it is used to refer to all the colors of autumn leaves. The word oyo refers to yellow leaves, and the word katsuyo refers to brown leaves specifically. After capturing some pictures of the pagoda, we walked up the gentle, forested slope that approaches the Daibutsu. The road was still wet from the early morning rain but the weather had improved greatly. On the right I stopped off at a small wayside shrine next to a small pond with a Jizo statue. 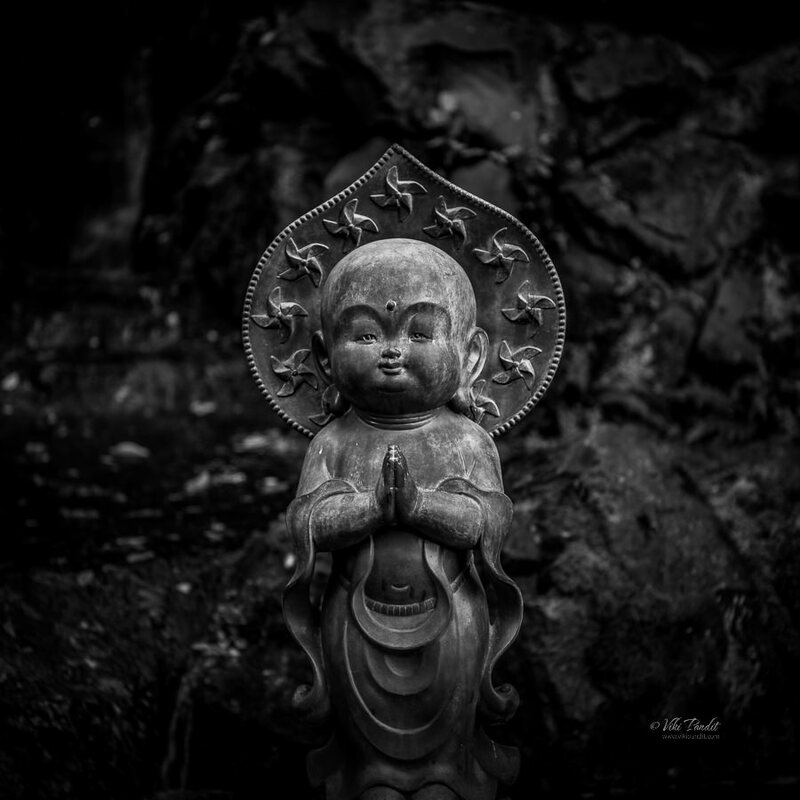 Jizo statues can be found in most temples of Japan. They are considered protectors of children. During the winter months you might see them dressed in a red woolen cap. 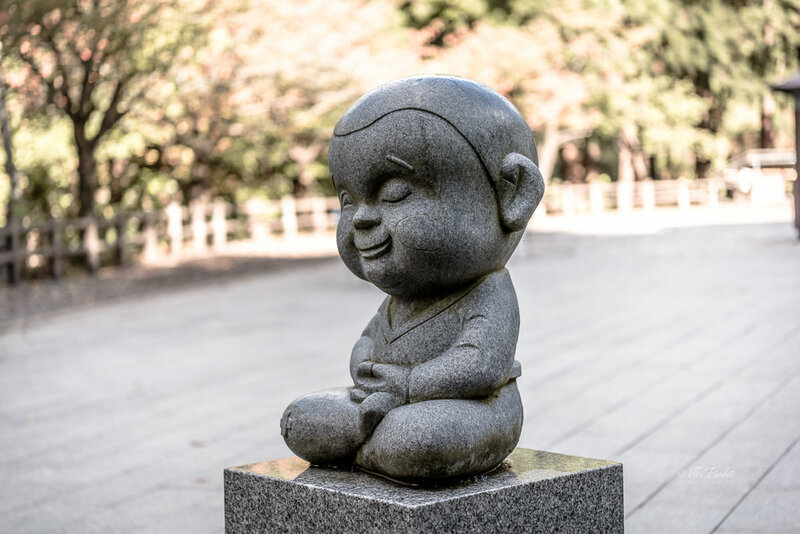 At the top of the slope there are a couple of baby-faced statues on either side, one of them sitting in an exact posture as the huge Buddha, at the entrance to the clearing where the Daibutsu sits in a meditative pose. Guarded by towering trees, I suddenly felt a sense of sereneness come over me. Cut off from the rest of the world, the meditative feeling is enhanced by the setting where the only sound is of the birds calling to each other. A few chairs are provided for visitors, where I put my camera bag and took some rest, quietly watching the statue in its meditative pose. The moment reminded me of my time in front of the huge Buddha in Ravangla. The Big Buddha in Aomori, better known as Showa Daibutsu was established relatively recent, about 34 years ago. The Buddha itself is made of bronze with ornaments designed on its arms, head, and chest. 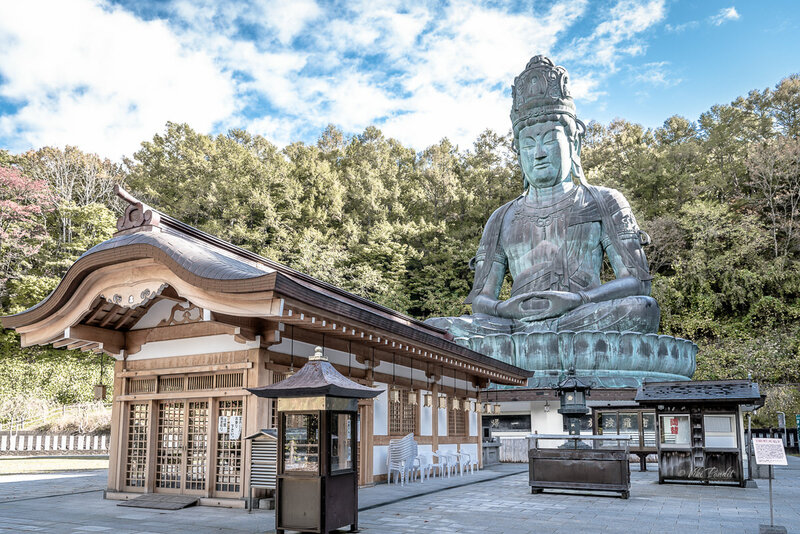 At 21.35m, the green colored statue is about 1.5 times taller than the more famous Kamakura Daibutsu (13.35 meters) and Nara Daibutsu (14.98 meters). Just like the Buddha at Kamakura, it is also possible to actually go inside of the Buddha statue from the back. On the outer corridor of the first floor and the inner part of the Buddha there is a depiction of the Buddhist afterlife including both paradise and hell along with proverbs. On the second floor there is a memorial for those who have died in wars. After taking a few pictures of the grand Buddha, we walked back to the bus stop. Showa Daibutsu and the temple grounds are a perfect place to spend some time in peace and tranquility. 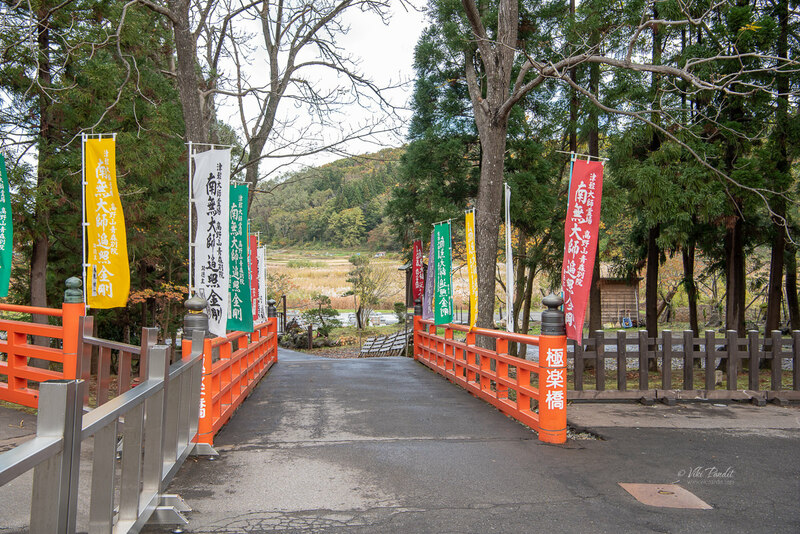 If you are in Aomori, it is a nice day tour to go on to replenish your zen energy. One of the best times to visit Showa Daibutsu is in November before the snow makes the region a little hard to traverse. 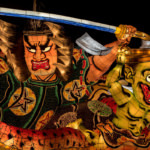 You can also visit during the Bon Festival in mid-August, when the Shingon Temples hold light ceremonies to honor the spirits of the ancestors. This Buddhist-Confucian custom commonly referred to as the Feast of Lanterns, commemorates the spirits of dead ancestors. The Seiryu-ji Temple is no different in this respect, holding grand light ceremonies for the entirety of the Bon Festival. Thanks for reading. 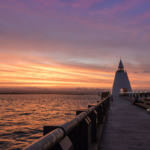 Please leave me a comment if you liked the post or follow my story as I visit the jewel of Hokkaido in Hakodate.